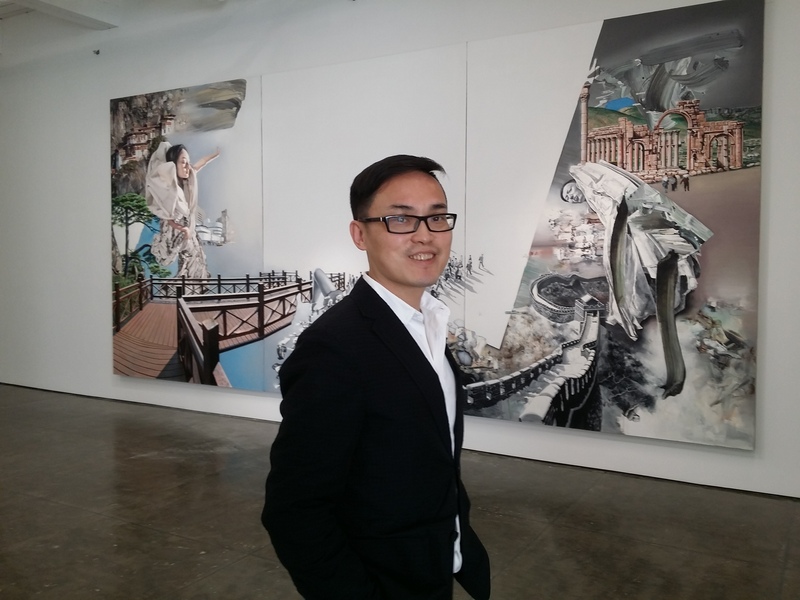 Sichuan painter Zhong Biao recently opened his third one-man exhibition in the United States, the first two having occurred in San Francisco at the Frey Norris Gallery in 2007 and 2011. This time his work is on view in New York courtesy of the Klein Sun Gallery (from Feb. 18 to March 19), in operation in its current 8,000-square-foot location in Chelsea since 2013. The gallery, which represents fifteen artists, including the emerging ceramicist and multi-media artist Geng Xue 耿雪 as well as more established figures such as Cui Xiuwen 崔岫闻 and Liu Bolin 刘勃麟, is one of the most dynamic outfits specializing in contemporary Chinese art in New York, if not the United States. Zhong Biao fits well within this pantheon, while a bit older than most of the others represented, his work continues to be fresh, exuberant, and even visually stunning. The show’s title, “The Other Shore,” refers in part to geography, the typical configuration of which situates China on one side and “the West” on the other. This arrangement, despite its obvious shortcomings, is operative in Zhong’s work. That “the West” is an entity at all, for instance, and in any case that “China” should be its counterweight, are both notions just about as questionable as they are frequently rehearsed. Zhong’s work actually invites such conceptual speciousness, and does so not in the fashion of artistic interrogation or even playfulness; his concepts are starting points from which he launches into something completely different. Nonetheless and in terms of geography, Zhong’s arrival after many years in New York is worth noting. New York, because the richness of this city brings with it a sense of security, a security that can fully accommodate my anxiety of choosing in the first place. This also illustrates the fact that ultimately, I have no idea what I really want from this life. Cities like New York are like fuel for the engine driving artistic work, coalescences of source material that become paintings. 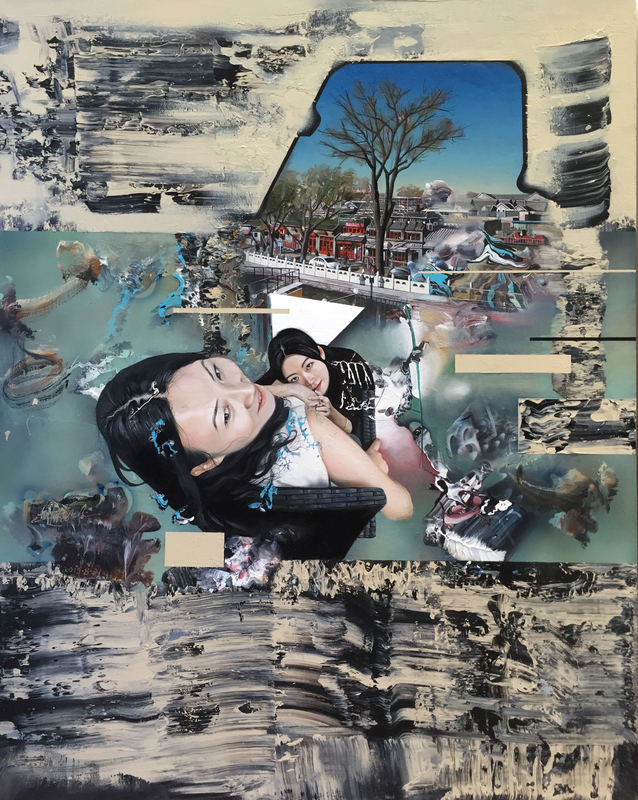 In practice, this means that Zhong creates paintings from images he himself captures using his own digital camera or collects from other print or digital media. The raw material of these images is then rendered and collaged by hand in oil paint or acrylic, generating images that traverse space and time while retaining a hyper-realist accuracy. Expanses of blue sky frame hairs on human flesh. Bodies, whether corpulent or lithe, old or young, are arrayed in environments built or natural, all painted in his signature minute detail. The scale of his paintings is also often very large, with his largest work—Mirage (2009)—reaching a width of fifteen meters. This scale enables viewers to travel from the quotidian to the cataclysmic and back again in the space of a single canvas. 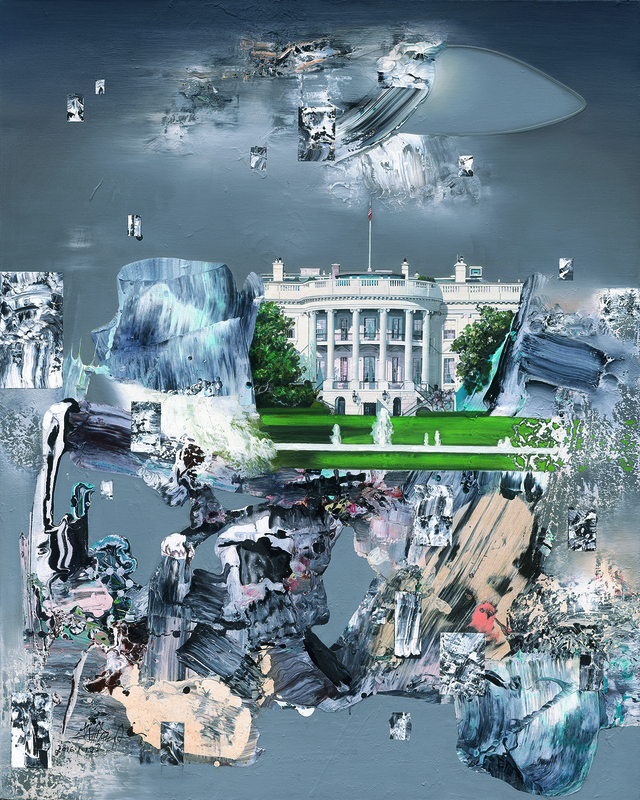 The scenes Zhong selects and then depicts are not random—they are resonant historical events, financial upheaval, political vicissitudes, scandal. These references serve to situate us as viewers securely in our present circumstances. House of Cards (2015), for instance, brings to mind the 2016 US presidential contest, and Chinese Dream (2014), is a reference to Xi Jinping’s optimistic if often derided slogan. 纸牌屋 House of Card 150x120cm 布面油画、丙烯 Oil and acrylic on canvas 2016. 中国梦 Chinese Dream 150x120cm 布面油画、丙烯 Oil and acrylic on canvas 2016. That said, to focus too narrowly on the thematic, symbolic, or referential elements of Zhong’s work is an interpretative misstep. The geographical or even thematic readings of Zhong’s “Other Shore” are therefore also limited. If there is one major theme that travels throughout his work, it is flight, whether of actual birds or of human figures in various states of levitation. The avian imagery carries with it its own set of symbolisms. 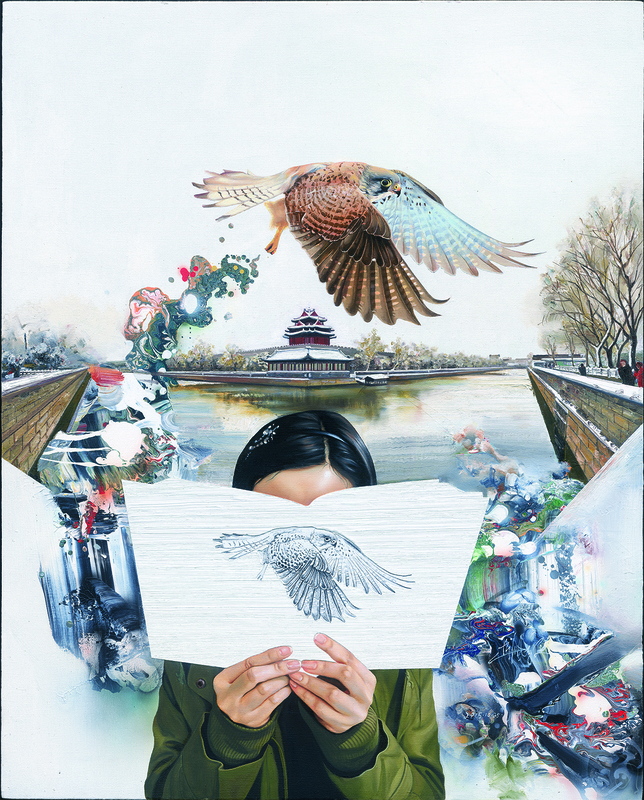 Cranes—a symbol of longevity, among other things—feature prominently in Zhong’s work, but we also see eagles, and even pigeons. The hawk in Take Off (2015), the Avalokiteshvara figure arising majestically out of Journey to the West, (2015), and the repeated image of a woman in flight seen throughout Velarium (2015), are prominent examples in this exhibition. 起飞 Take off 150x120cm 布面油画 Oil on canvas 2015. 西游记 Journey to the West 280x200cm 布面油画、丙烯 Oil and acrylic on canvas 2015. 天幕 Velarium 100x75cm 布面油画 Oil on canvas 2015. But this is flight not entirely for its own sake. Zhong’s flight is part of a larger inclination, namely to transcend boundaries and constraining forces of almost any sort, beginning with gravity and moving on from there. The connection with our present moment is studiously observed, and highly relevant, for therein lies part of the energy of Zhong’s work. But the energies are only observable in juxtaposition to one another. For example, in The Other Shore (2015), Palmyra, a recent casualty of ISIS aggression in Syria, occupies the upper right portion of the canvas. 彼岸 The Other Shore 280x600cm 布面油画 Oil on canvas 2015. I am always looking for an underlying or internal order driving events, and moreover attempting to use this order to comprise my own works. No matter if its ancient, modern, local, foreign, direct, indirect, whatever enters the ear, eye, mouth or heart, even if its source is gossip on the street, in the end all that can be perceived comprise the greater environment of our existence. With this decade-old quote in mind, we may move on to what is and what has been “The Other Shore” in Zhong’s work for a long time: time. For Zhong Biao the artist, it is the problem of depicting time that has preoccupied him from a young age. As he recalled during a recent speech given at an exhibition in Beijing [see embedded above], the facts that perception of an event, even one taking place directly in front of us, still occurs milliseconds after the end of the occurrence, or that the light we see coming from a distant planet actually appears to our eyes only thousands of years after the death of the planet, were entirely befuddling to him. If, he continued in this speech, we consider time to be a cake, and we cut the cake in two, with the past on one side, and the future on the other, we find ourselves with nothing but a knife and a handful of emptiness. It is also this preoccupation with time that drove Zhong, around the year 2006, to include abstract images in his work. The abstract strokes are depictions of the forces that pervade our phenomenal world, ever-present and yet not confined to linear sequence of spatial reality. This abstract element has also evolved subtly, but notably, in his work over the years. In earlier paintings, there were smooth swaths of color, executed with large brushes in a balletic process (Zhong works with an assistant who helps him move large canvases up and down as he quite literally dances and paints in front of them, often with thunderous musical accompaniment). 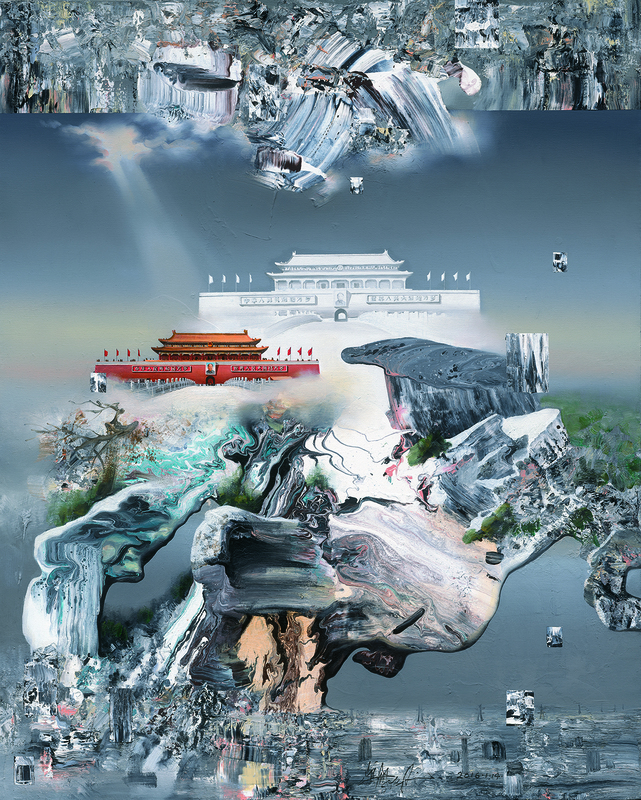 Those abstract forms were akin to the occasional video installations Zhong includes with his exhibitions, where hyperrealist images from paintings appear on a video screen, and then dissolve, with traces of recognizable figures giving way to completely abstract forms before reconstituting as new figures. More recently, the swaths have grown richer, more angular and three-dimensional, giving a sense of layered or parallel realities torn from one another, conjuring memory both recalled and ruptured. Houhai (2015) is an excellent example of the way Zhong now deftly weaves hyperrealism with complete abstraction, allowing him to challenge the limits of each in a single canvas. In fact, the blend of figural and abstract is broadly emblematic of Zhong’s work, both as a painter and a thinker. His goal is to use painting, among other artistic media, to challenge the limits of space and time that frame both his art and our experience. Not surprisingly, frames themselves are often the subject of his work. Such aesthetic strategies are more than mere meditation on the function of art and our responses to it. Instead, addressing his medium while he works is part of Zhong’s push against our understanding of the phenomenal world itself. His clever juxtapositions of disparate thematic elements that seem to enliven our current affairs, whether by reminders of still resonant events in human history or reference to current preoccupations such as terrorism or environmental distress, are actually distractions from a deeper appreciation of the degree to which we as perceiving subjects are mere conduits for energies that at any particular intersection of materialized space and time manifest as “now.” Zhong’s work, in other words, points to a state of immense surrender, to a condition where our privileging of ourselves in the here and now dissipates in a cosmic flow both ancient and endless. This also generates the essential dissatisfaction with his work, an ongoing frustration with the gaps between perceived world and the true moment (当下) of our being. At least for the moment, this frustration has not translated into a withdrawal from painting itself. May that remain the case for at least a while to come. Bazaar Art and Fashion 芭莎艺术.“Artist Zhong Biao: Without Curiosity, There Is No Inspiration” (艺术家钟飙: 不怀揣问号, 还想泡灵感?). Interview, 25 Dec., 2015. Web. 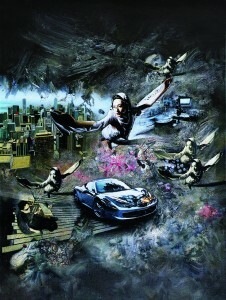 Quoted in Ubiquity: Zhong Biao’s Works (无处不在: 钟飙作品) 1994-2004 (Shanghai: Artscene China, 2004), np. 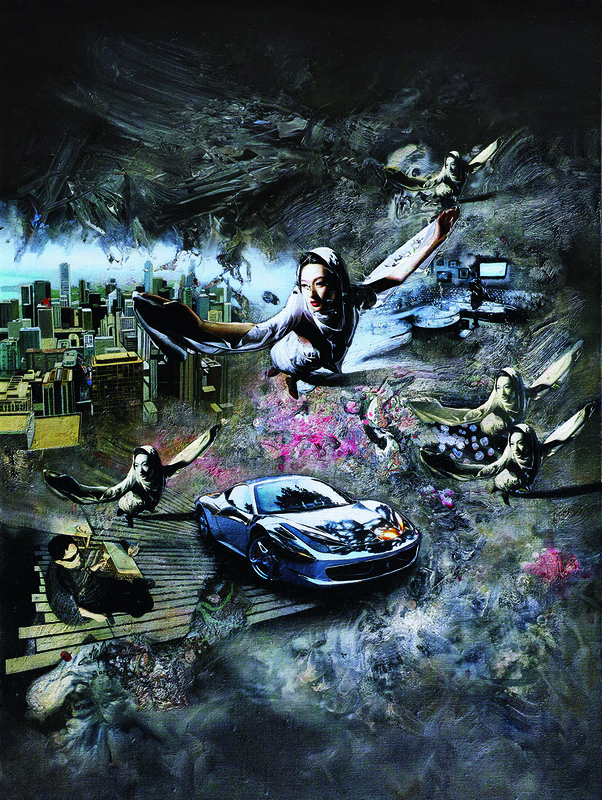 Zhong Biao. “Exhibition Closing Remarks,” Zhong Gallery 中画廊, Beijing. 15 Oct., 2015. See video embedded in the essay above. Zhong has worked almost entirely in oil or acrylic paint, charcoal and other such material on canvas almost exclusively. The only outlying example is the 2011 Suzhou exhibition “Tailoring Clouds,” is a good example of such attempts. Unlike previous experiments, where video installations provided distillations of images he provides on canvas, “Tailoring Clouds” involved extensive installation of artifacts (burial stones, petrified rocks, miniature structures, 3d printers and more), a cohort of Zhong Biao-esque elements which actually demonstrated wide-ranging intellectual interests quite well. Zhong is fond of painting frames, which can be either paintings within paintings, or, as in the series from 2009, contrasting abstractions and frames. Invisible Possibilities 无形的可能性, for instance, depicts frames within frames, in some cases including viewers observing the “canvases” from within the canvases.